You will not be able to do all the caregiving needed by a loved one with Lewy Body Dementia. At some point, you will need help. Maybe a great deal of help. With luck, you’ll know people in the community or family members who can contribute enough. But that was not our experience, perhaps because our loved ones so often become increasing isolated as they get older, neighbours move away, and friends and family members become unable to help. You’re probably going to need to hire help. 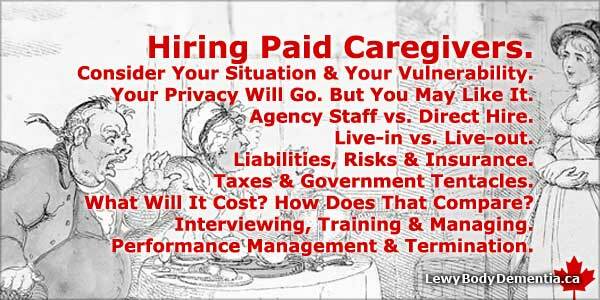 Hiring paid carers to help with Lewy Body Dementia is easy, but finding the right person is critical. In Canada, they’re referred to as Personal Support Workers (PSW’s), and they come from many walks of life, culture and education. Somewhere, there’s a person who is a perfect fit for you, just waiting to be found. Two overall sections will be covered in this article. Section 1. Realities of having paid help in the home: broad considerations, difficulties, concerns and benefits. Section 1 — Realities of having paid help in the home: broad considerations, difficulties, concerns and benefits. Before you bring the first person onboard, consider your situation critically. Most people living with dementia are the definition of “vulnerable.” Having someone into your home to help you can add a new level of vulnerability. It isn’t that you will be instantly robbed or taken hostage, but perhaps more that you may become beholden to them, as they become more integral to your life. As they get more attached to you — and you to them — the roles of employer and employee can blur. Sometimes this is miraculous and wonderful, forming an unexpected symbiosis. But reliance can also be used to gain unfair advantage, putting you in a difficult position if you are perceived to have few other options — or none. Make sure friends or relatives know who is helping, what they’re supposed to be doing, and their contact information, in case anything isn’t going well and you need some backup, or if there is anything you begin to feel uncomfortable about. Although relatively uncommon, there is always a possibility that you could have things stolen, or that you could be subject to assault. Keeping valuables stored in a locked area is prudent. Some people have security cameras installed, but those are a minority. As technology improves and gets less expensive, though, it is something worth considering — it can also allow another person to keep an eye on things remotely, to make sure everything is OK. But having surveillance cameras may compromise your privacy more than you’re willing to accept (although you can always choose where to place the cameras, with one in the kitchen, so they aren’t as intrusive). Having people drop by unexpectedly, and as frequent as possible, greatly aids in reducing the potential for abuses of any type. Once you have someone in to attend you or your loved one, your own sense of privacy and personal space will likely be forfeit. Paid carers usually help in the most personal of situations, like bathing, toiling, eating and sleeping. The transition from self reliance, to relying on another person in these intimate realms can be very difficult, whether you are the one hiring, the care recipient, or both. Conversations will no longer be private, telephone calls and visitors will be overheard. You may want to lay down specific expectations early, to have a way to ask the person to excuse themselves until called back, so that you can discuss things with your loved one privately when you choose. If you are not used to having help, this transition can be a very awkward period. But it usually lasts a relatively brief time, and you will likely come to appreciate the company, the help and the security of having an extra set of hands. You may have had the belief that “the government” had a funds that will help you out when health was failing and the shared goal is to stay at home as long as possible (where it costs the health system significantly less than being placed in a long-term care facility). Think again. Sadly, you are entirely on your own most likely. Veterans may have supplemental funding available. Inquire if your insurance policy covers anything. There are, very rarely, respite-care grants from donations that can be provided from not-for-profits. Government funding options may exist for seniors to stay at home, and is worth inquiring about. Subsidized rates may also be available if you hire through a seniors centre. This is where they get some government funding which can be applied as they wish, and sometimes they’ll put some money towards lowering the costs of hiring PSW’s for the members of the seniors group. Paying more hourly will likely get you a better worker than paying the minimum. There is enough demand for PSW’s that almost anyone seems to be able get a job in this line, no matter how unsuited they are to the work. However, if you provide a good work environment, recognize the work the employee does with appreciation, and genuinely connect with them, then you will likely be able to get a better worker for a lower rate. Most people would prefer to work at a job they like for less money, than to work at one that they hate for more money, as long as they can get by on what they’re earning. Thinking about what you really need help with can lower the cost. If you require more specialized, professional services like nursing or wound care, the rates will be higher. Determine what is most important, and be honest about what you can continue to do yourself, and budget things accordingly. Rates vary significantly by region: check with local groups to get an idea of hourly costs. Frequently, what is needed most is overnight help, so you can get some uninterrupted sleep. Overnight help is sometimes billed at a lower rate, if the PSW can sleep during part of the shift as well. But that depends on the current dementia behaviours, which can change drastically during the evening. To accommodate sleeping, you’ll also need to provide something appropriate for the carer to sleep on. So what does it really cost? I’ll give you a rough estimate. In Toronto, Canada, using roughly minimum wage, paying legitimately, with income-taxes and employment insurance premiums included, and to get 24-7 coverage, is significantly more than $100,000/year, in Canadian dollars. Local wages may differ, but are unlikely to be much, if any, less in developed countries. Estimating $10,000+/month is not unrealistic. We all wish it was not this costly, and does not need to be, but if everything is done legitimately, it is mind-numbingly expensive. Considering that government subsidized long-term care costs are $2,500/month or less, this is a significantly more expensive. But if it only lasts a few years, many people would say the cost is well warranted. In your calculations, also keep in mind that if you decide against hiring, and place your loved one in a long term care facility, be very careful checking into what the care-home will actually provide for assistance. In many places, all help is an “add-on” cost, including help with feeding, dressing, bathing, etc. Check in advance, and press them on what they actually include, and who they allow to help, and what they charge for that help: what may seem like a cost savings at a long-term care home may only be because you have an incomplete picture of the real costs. Finally, overtime is a common expectation after 8 hours of work in a single day, or over 44 hours in a week (at least in Ontario it is). This means that beyond that, 1.5x the normal rate will have to be paid. And in addition, working beyond 52 hours in a week may require written consent from the Ministry of Labour. Jurisdictions may differ, and you may agree upon a different set of expectations, hours, and compensation, but a great deal of additional cost can be incurred as soon as an employee works long hours. There are countless agencies that provide personal support workers, housekeepers, nursing staff, and more. All are not created equal. Using an online ranking service like Yelp, or a similar user-ratings service may help you find out whether a company is as good as they claim. Some personal references will also help you evaluate the truth from the sales pitch. We went through a few agencies before finding one that had a process where we could screen each of the PSW’s before they started working in our home. That helped a great deal in making sure the person was a good “fit” in terms of personality, comfort level, sense of humour, respectfulness, sensitivity and experience. Costs vary, but agency-provided staff are frequently twice as expensive as hiring privately. Hiring privately is typically less expensive. However, you will then be responsible for more planning and administration, including scheduling and substituting if your regular person is sick. In addition, you will likely have to register with the government as an employer, calculate their income tax, remit income taxes and employment insurance premiums to the government, provide proof of adequate insurance, and more. However, if they are hired as an “independent contractor”, they may be responsible for all of that, although the per-hour fee will likely be higher. It is worth inquiring with an agency, as well as a directly hired person, whether they are flexible on their fees if there is a significant number of hours involved. In many cases, the actual demands of caring for a person with LBD are not very difficult, and this may allow the paid caregiver to do other things while they are at your home. Just make sure that you are always the priority, not other activities. Hiring someone to live in your home, and help as needed, may be significantly less expensive than hiring someone on a per-hour basis. But you will need to provide suitable accommodation, and be prepared to have the many disruptions of a new person in your midst all the time including fridge and cupboard contents changed, bathrooms in use unexpectedly, noise, scent and additional voices. This may seem petty, but any minor nuisance can become more significant as time goes on, and as tempers may flare as tension increases from external sources or the worsening condition of your loved one. Ideally, you will be able to find someone who is experienced and eager to please, that will work for a wage you can afford, will be accepted by your loved one, and will integrate well into your routines. If you cannot find someone, there is an infinite number of people worldwide clamouring for an opportunity to leave their country and work hard for a better future. Consult with an immigration lawyer if this is something you are considering, so you know what’s involved, and how the process works. Immigration agencies may help, but their primary mandate is often just to make money from poor people desperate to leave their country and more money from desperate people in great need, wanting to hire someone quickly. Inquire about ethics and do due diligence to ensure the immigration agency is not a vulture. Incredible people are available. They are out there looking for to work helping others. Make sure they can find you and that you can find them, whether they are close to home, or on the other side of the world. It is prudent to investigate your potential liability if you are going to have an employee in your home. There may be completely unforeseen risks relating to workplace injuries or aggressive loved ones, among countless others. Your insurance policy may need to be adjusted. Workplace safety regulations may govern aspects of the home you never considered. Employment standards like fixed break-times and meal breaks may apply. Overtime pay may be required after a seemingly short time. It is worthwhile to find out what you may be on the hook for — beforehand, if you can. Check into the legal implications of having a paid-caregiver actually living in your home. Their may be elements relating to insurance, liability, workplace health and safety and responsibilities of local employment standards acts which are different in a live-in situation than if you hire someone who does not live with you. Employment lawyers will likely know many details, but local Alzheimer’s and Parkinson’s associations, seniors centres, labour ministries or government offices may also have the information, at no cost. The reality of caregiving crises dictate that you may need someone almost instantly. In those cases, the easiest and fastest solution will likely be to contact an agency, and get someone in immediately. Once they’re in, you can proceed as quickly as possible to investigate your options, and make a switch if that is the best solution. Income taxes and government clawbacks, such as unemployment insurance deductions, must be calculated and remitted by the employer in almost every jurisdiction in the world. Non-compliance can result in fines and dogged unpleasantries from tax officials. Unless you are good at accounting, familiar with tax preparation, and have the time, expertise and skills to do this, get help. Having a bookkeeper or someone familiar with payroll involved, at least in the beginning, will make things smoother, and should lessen the chances for tax nightmares later. It may be possible to claim the cost of hired help as a tax deduction. You absolutely should get some sort of tax break for this type of legitimate medical expense. Generally, with anyone brought in through an agency (where payment goes to the agency, not the person directly) taxes will be dealt with by the agency, not you. Same situation for an independent contractor. Any “under the table” or “grey market” payments cannot likely be used on tax documents. Although there are many people who have to use this payment method simply because they cannot afford to pay taxes on top of wages, and because some paid-carers prefer cash so they do not have to pay income taxes themselves, this is likely illegal. Check with someone locally to see what taxation rules apply in your particular case. If you become an employer, rather than using an agency or hiring an independent contractor, you will also likely be responsible for providing paid vacation time, based on a percentage of annual time worked, and paid sick days as well. Look into your local legislation to get specifics for your area. This can throw a curveball into your planning both for scheduling and cost, and should be investigated in advance. Getting someone local is very important, since you may need them on short notice — and get more than one screened, so you always have a backup. There are many places to look for a PSW. Start by asking people you know for personal references. Get the word out that you’re looking: many people may have used these services and might not have mentioned it, but will have insights to individuals or providers in your neighbourhood. If you know someone who uses PSW’s already, ask them to ask their staff to give a recommendation. There tends to be strong networks of paid caregivers, and quite often a good one will know other good ones. And once you have one working for you, ask them to recommend other people they know and trust. One caveat is that if a single PSW begins to have influence over others, that can put you in a difficult position if you ever have to discipline or dismiss that person. Online classifieds such as Craigslist and Kijiji have extensive job posting systems based on location, so you can select where you live and find people nearby. You can review people seeking work, and you can create your own help-wanted post. These websites are very high-volume, and have lots of jobseeker visibility, and should yield some good interest. Speak to local Associations for Alzheimer’s and Parkinson’s Disease to see if they have any recommendations as well — they may know of people who are looking, and were caregivers to people who no longer require their services. Local seniors centres may be a great resource — you can likely call them to see if they have any ideas. Most local newspapers still have classified sections, and even putting a well-worded sheet on a supermarket or community centre notice board may work well. Where you live will, of course, affect how many responses you get. But you may find people of exceptional calibre nearby, even if you are very rural, and who are delighted to be close to home. Interview candidates in a controlled environment of your choosing. If possible, do an initial interview by phone first, to see if you would even want to meet them in person. You don’t have to give your address immediately, for added protection. Get a second person for the interview if you can. They don’t need to do any of the “work” of interviewing, but they can help add a perspective to the assessment of the people, and they may pick up on different attributes or inconsistencies in a candidate. If you can, keep others involved in the process of hiring and managing on an ongoing basis, so that everything doesn’t fall exclusively on you, once a PSW has been hired. This also provides a way so that you can get another person to be the “bad guy” if needed. Ask for references of clients, and the permission of the candidates to contact the references. Some may have very few, or none, depending on their experience. If so, ask for other references, like community group leaders, teachers, ministers, neighbours or former employers who are not relating to their caregiver role. Be sure to do a check on at least one reference, to get a feel for how accurate the candidate was portraying themselves. See if the reference will corroborate an answer the candidate provided you. After all, they will be in your house, with your loved one in an unprecedentedly vulnerable position, so you should minimize all risks. Some caregivers are bonded, or will provide police checks, since the line of work deals with such a vulnerable line of work. An appropriate question may be whether they would allow a police check to be done on them, even if you will not do this. If they’ve gone through training to become a certified PSW, the school may have background checks that are available to potential employers. And even if you’re dealing with an agency, you can still inquire what kind of assurance they provide about their employees. Clients do get items stolen, get ignored, neglected and abused. It is not nearly as common as may be indicated by the media, but being vigilant before you have someone into your home will greatly lessen the likelihood of any potential problems. Performance reviews are two-way meetings. You should get as much out of these sessions as your employee does. Let your employee know how they are doing for two reasons: So they can feel good and appreciated about what they’re doing well, and learn what needs to change or improve. These are both highly important to success of your venture. Similarly, you should ask specific questions about what works, and what needs to change, in case they can be improved, and to explain if they cannot. This shows you value your employee, which is close in importance to pay in many situations. And since they may get very little, or very confusing, feedback from a person with Lewy Body Dementia, it falls to the employer to provide all the feedback, and to set expectations. This will allow you to set measurable goals as well, which you may have set up immediately, and if so — you can now refine them. For example, once things settle into a routine, you may find that what is needed has changed, and that they need to now assist more actively with, for example, teeth brushing, assisting transfers from sitting, to standing, and to bed. The performance review is a good time to make sure that’s clear. Make notes in advance, clarify your thoughts, and be prepared to be presented with denial, defensiveness, or deflection. These are all normal reactions to what may be perceived as criticism, but keep focused on the tasks, be non-judgemental but clear, using specific examples, and if the employee/employer relationship is solid, things will smooth out. Some people may never have had a performance review before, which can make them initially intimidating or awkward. But in time, with genuine two-way, respectful dialogue, you will both benefit from these sessions. Set a precedent early by doing performance reviews regularly, and particularly near the start of employment. This will your PSW to become used to getting feedback, and so they can provide feedback to you. You will need to ensure your new hire has a clearly defined role so you’ll get exactly what you need, with no misunderstandings. You will have already thought through what you need, but it should be in writing: point form is great for this, so it’s easy to scan. The best way may be to prioritize the items numerically, with the most important at the top, so you can easily go through them, and also so you can easily remind the PSW if something needs to be done. This list will likely need to be updated once things are underway because there will almost certainly be things you missed, or now find unnecessary. Priorities will change, and having them clearly laid out will help everyone understand. Post it somewhere so it can easily be referred to if needed. But this may not be possible or appropriate, depending on how your loved one perceives the tasks, and the employee involved. Provide as much information about the condition as possible, so your PSW can learn. If you can provide online links to pertinent information in advance, and printed material to read onsite, that will likely make things smoother. Lewy Body Dementia is a lesser-known condition: providing information on it, and particularly on how to best handle typical LBD behaviours will go a long way to making this a smooth transition. Have your caregivers learn from these online resources. It is likely that you will have preferences that are unique to you: idiosyncratic habits, must-do’s, obsessions. Whatever you want to call them, make sure those are noted and understood. Small things like the way you want silverware to be handled, hand hygiene, flushing of toilets, locking of doors, leaving lights on or off can all become issues. You’ll have to find the perfect match between too much nit-picking detail, and no direction at all. But if there is resistance to doing things how you want near the beginning, that is the time to consider hiring someone else. Try to clarify things first, it’s so easy to have a simple misunderstanding lead to a bigger problem. What do you need done? Make a list. I’ll only include a few things below, but will expand further on this topic in a future article. Expectations on how the task is to be completed should be clearly laid out as well, and this may need to be adapted once you have a PSW start working. They may teach you things you never knew, since they likely have had more dealings with dementia than you will have. Certainly there is an incredible wealth of knowledge in most PSW’s, and hopefully you’ll be able to learn valuable insights from their experiences. Common PSW tasks include: Toileting. Bathing. Bed-time assistance. Feeding. Clean-up. Exercise. Redirecting. Joyful companionship. Activities of daily living. Physical support for walking. Transfer from bed to standing to seated. Safety precautions. Dressing. Medical appointment attendance. Medication taking. Etc. Expectations can be laid out clearly relating to tasks, keeping it as well matched between micro-management and merely assuming things will be done right. Here’s an example. Make clear the things that are not allowed, as well as the things that must happen. Handheld devices and smart-phones are now ubiquitous. They are an enticing distraction, and it is all too common to see care-workers using them while on duty. This is fine, within reason, if everything is under control and the client is not being neglected. But be aware that sending text messages, updating Facebook, watching videos, and using social media is very distracting, and the worker may miss what’s going on. Be especially careful to clarify whether you allow headphones or ear-buds during work hours. These can make spoken requests inaudible, especially problematic for someone whose voice is weak. Raised voices should be discouraged, and for anyone with compromised cognition, hearing voices in different languages will likely be confusing, and should not occur within earshot of the client. Unforeseen transit delays can happen, as can illness or other issues. But they should be exceptionally rare. And whenever they happen, you should be notified in advance. This needs to be clarified from the beginning — that you require advance notice of lateness or absences. Days off should be approved in advance at an interval far enough ahead that is acceptable to you. If you can, keep a schedule visible so there is no misunderstanding. You may be able to use an online calendar that you share with them, or you can print and have them sign a two-week schedule in advance, to acknowledge they have received and understand it, leaving them with a copy for themselves. Paid carers that don’t show up need to be dealt with quickly. This does happen. And it can make life extremely difficult. Since some will have 24-7 care required, if a person doesn’t show up for their shift, you may not be able to convince someone to stay late, or cover the full shift, and that may mean you will have to do this yourself. This is something to consider critically, particularly if two-person transfers are required, which you would be unable to do yourself. Make clear what will happen as a result of lateness and absences before the PSW is hired. Mostly, it will not be needed. But preparation and clarity will help mitigate any problems. Keeping the person with a “probation” period where either you or they can sever the work agreement on short notice with no penalty is common. You will most likely know in advance whether you suspect something will be amiss, but having this option is good. And it goes both ways — sometimes people who are genuine, well-meaning and kind will be truly unable to do the work required, but won’t recognize it until they’ve been doing it for a while. Caregiving is an exhausting experience, and completely overwhelming for many, even if they are not emotionally invested. This can be very difficult. Especially since it may have to do more with the PSW not “fitting” well with your routine, or being disliked by your loved one, rather than there being a specific, purely performance-based problem. It is infinitely easier when you use an agency, since you merely cancel the contract. Make sure to check that there are no termination penalties, and you may need to continue to the end of a contract period, if there is one. Generally, you’ll just be using a service, and you can cancel at any time you want when it’s an agency. It’s their responsibility to find other work for the PSW, not yours. Keep your eyes open all the time for viable alternatives, since situations are constantly in flux, and having backup is a necessity. An employee may also leave by their own choice, so having backup is prudent for those times as well. Be aware and alert to subtle hints your PSW may be presenting, and it may be helpful to regularly ask how they are doing and if there is anything that could be improved to keep them satisfied. Sometimes there is something very easy to accommodate, that will make life a lot better for your employee, and have no impact on you, such as changing the shift-start and finish times by a half hour to allow your PSW to make their children breakfast. Asking shows that you care, and may help retain an exceptional employee. If you have hired someone directly, and have become the employer yourself, dismissing an employee can be tough. It’s emotional, since it’s a real person who likely counted on the income, and because they become so closely integrated into family life and activities. It may also be difficult for the person with dementia since they may have become very attached, or at least comfortable with the person, and changing staff can cause disruption, stress and upset, which can often lead to behavioural issues with your loved one. When a PSW is a bad “fit”, they don’t connect well enough with your loved one, or if there are other significant issues, you are right to dismiss and replace them. The sooner this is done, the better, in most cases. Work is not charity, and you’re likely in such a tough situation already that having to contend with another issue — like poor performance — is more than you should deal with. After reading this, hiring someone may now seem very fraught with difficulties. The hazards discussed are merely precautionary, to avoid those hazards…not to deter you from getting the help you need. There are incredible individuals out there that can be saviours to you, and incomparable companions to your loved ones. I recommend you try a paid caregiver, keeping in mind all that’s been covered so that you’re prepared, and can make the most of the experience. Try it out if it sounds right. If this raises too many concerns, and makes you think it would be too uncomfortable, awkward or unworkable, you can use the document to help make a better-informed decision on how to proceed. Remember, you are the boss. Your employees should do what you want, when you want, and how you want, if the requirements are clearly communicated, understood, and reasonable. This isn’t about “friendship”, although that can genuinely become a part of it. If you pay, it’s your say. Printable Resource worksheets and guides. My mom had a catastrophic fall in her kitchen in July 2012. She fell backwards, likely due to Parkinson’s “freezing” or just instability from Lewy Body Dementia (LBD), breaking her T7 vertebrae, and her sternum, and hit her head so hard on the trim on the wall that she cracked the plaster. Off to the hospital in an ambulance, sirens blaring, with high priority since there was so much bleeding, particularly in her mouth (which we later found was due to wildly fluctuating levels of blood thinners coumadin/warfarin, so her INR was close to 10, but should be between 2 and 3, which is another issue entirely). She was in the hospital for several days, where she almost instantly developed Hospital-induced Delirium, a jump-off-the-cliff type of cognitive impairment. From the hospital, she was sent to a rehabilitation facility for a month, although she was able to be discharged in a few weeks, thankfully. From the onset of delirium in the first hospital, we needed round-the-clock attendants, unless we were going to “restrain” (physically bind her or completely immobilize her in a chair), or sedate her: neither of which are acceptable. This meant we had to hire some help because there was no place to sleep in the room, and I couldn’t do it alone. We hired the initial people through an agency. One of them was particularly wonderful — a nursing student doing this as a summer job to get experience with geriatrics. She was a great introduction to the PSW “species”. Since then, we have continued to use agencies, as well as getting some help through Community Care Access Centres (CCAC, the government agency that doles out assistance for specific needs to Ontario residents) in this case, a few hours weekly, which we are very grateful for, but which is infinitely less than we had ever believed would be provided. In the end, we have become direct employers, hiring, scheduling and managing our excellent PSW’s, although CCAC still assists us with a few hours each week. Since the catastrophe in 2012, she lived in her own home, but we continued to need round-the-clock assistance until her sudden death in 2016. The cost was excruciating, but as my father says “progress has been made”, and I have no doubt that she did infinitely better at home than she would’ve anywhere else. Postscript. This is one of the best, most fascinating and poignant stories of paid caregivers I have seen recently, and puts much of what they do in perspective. It is not an easy job and, culturally, does not receive much respect. Thank you, Timothy. You’re article was very helpful. I’ve had caregivers coming for around 4 years now, but only recently have we moved to 24-7 of someone needing to be there. Your outline was reassuring that I’m doing things as best I can and the topics covered concerning employee training, expectations, unacceptable behavior etc was very useful in my current situation. Your last line and sign off of “Here’s to keeping it going as long as it’s needed. Somehow… Strength!” really struck a chord as I’m asking myself this very question of how am I going to continue for quite possibly years?! I need that assertion of strength. I can do this! I think. Thanks for your perspective, Christine. How one will pay for what is, as you point out “quite possibly years” is a mammoth dilemma. The way I look at it is that every moment that is a good moment, is one fewer unpleasant moment, which is almost priceless. If one has the luxury of maintaining a person in their own home, even if it means great sacrifice, it seems warranted to me, anyway. Strength to you in finding some way to provide the best environment you can under the circumstances. It will likely change, but know that you are doing a great, powerful thing. Timothy.